I have posted many pieces of art and writing by Julia and Emma, and Rachel's artistic bent is in photography. 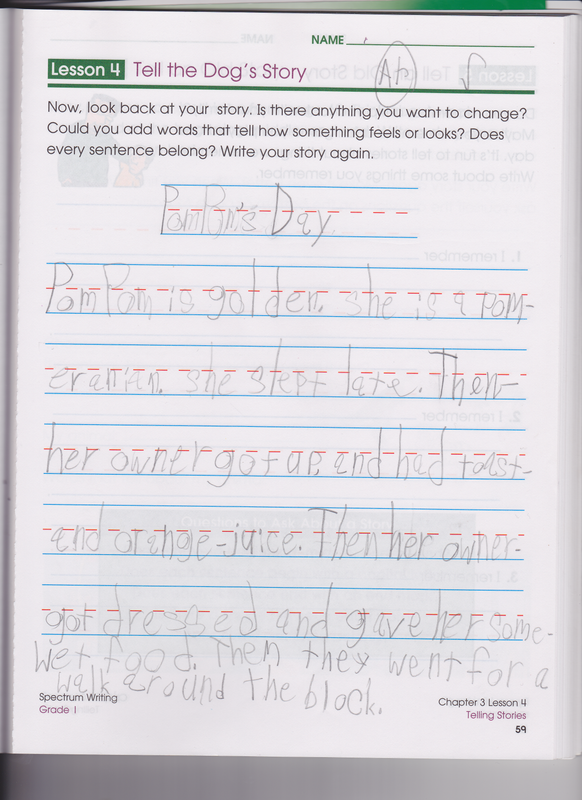 Ben has not previously showed too much interest in spending time drawing, though he does enjoy writing sometimes. So it came as a surprise to me when he spent nearly an entire day drawing comic strips featuring Rabie Baby. This may need some explanation to some: for several years now, Julia, Ben and Emma have played a hilarious game they call Rabie Baby, in which Emma is a baby who has--well, rabies! The rules are many and complicated and I'm not sure I know them all, but I know that Rabie Baby is afraid of water (hmmm...she IS rabid, after all, so she has hydrophobia) and can be tamed by being (lightly) whipped with a dish towel. She also loves to move in slow motion sometimes and she's very good at death scenes. It is a game that has brought us much laughter. Fuzzles are cute, loveable animals that are often kept as pets. They are never evil at all. They do not bite, are good with children, but do not like loud noises. But one terrible roar scares them too much for them to run. Yes, it is the Legendary Raibie Baby. They worship her, hoping that the rabid Fuzzle will not eat them alive. She has only three weaknesses, and only two people know them. These two people are named Ben and Julia. And the weaknesses are: water, a dish towel being used as a whip, and furniture. They ward her off with their weapons--into the human world! Julia and Ben are the only ones who can stop her! List of Raibie Baby's nick-names: Rubba Bubba, Rubziti, Rubba Babeer, Rubba. Weird? Yes, but imagination is a wonderful thing! This one is my favorite in her series of cats. Julia's 11th birthday was Tuesday (can't believe it, but that's another post!) and she had asked for drawing paper. We buy computer paper by the ream, origami paper by the family pack and construction paper in two sizes, which covers most of our art needs. Sometimes the kids like notebooks, blank journals or sketchbooks, and I have gotten larger drawing paper on occasion as well. We were out of good drawing paper, and Julia wanted larger, heavier paper for her dragon pictures. Rachel said that this was something she could give her sister, so we went to Michael's and Rachel had the good fortune to find nice, heavy drawing books that were buy one get one free, so Julia ended up with two. It ought to hold her for a month, anyway! Of course, I cannot walk through Michael's without buying anything, so while Rachel looked at paper I was poking around in the art supplies. Julia's main gift was MarioKart for the Wii, which came with the steering wheel control, and I'd gotten her more of the warm, long socks she loves with stripes, dots and bright colors. So I figured that while she didn't need much more, another small gift wouldn't hurt. 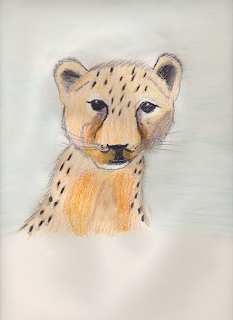 I found a beautiful set of 24 pastels, and a box of sketching pencils, the kind that smudge properly for shading. Julia opened her gifts on her birthday morning, and was delighted--and was even happier when our beloved neighbors stopped by with an art book for her. 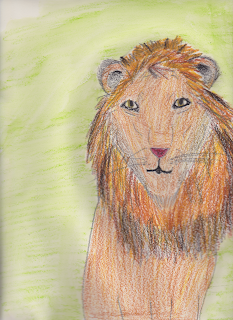 We do have several books on how to draw, which Julia actually never got into because she felt that it was copying to use someone else's ideas, but perhaps because it was given to her by Linda and Dennis, she started looking through it right away, and when she came to the animal section, she was hooked! 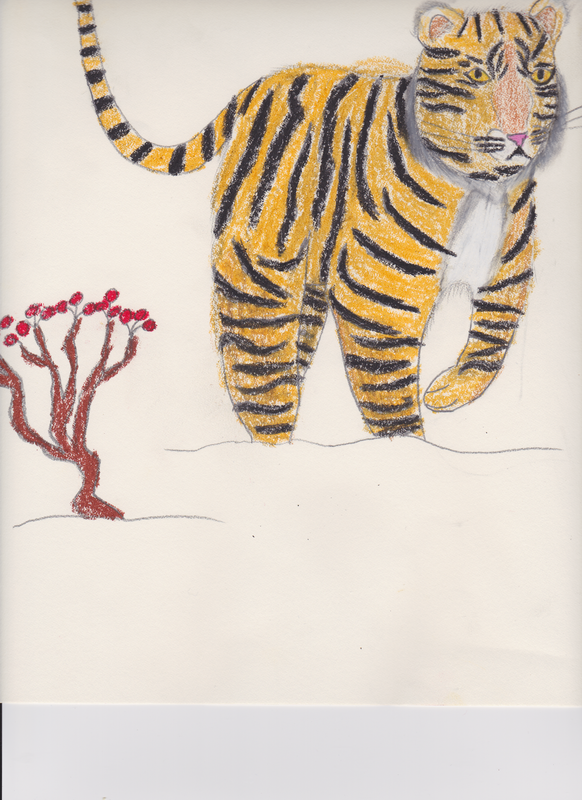 She has spent much of the past two days drawing, and is working on a series of big cats. 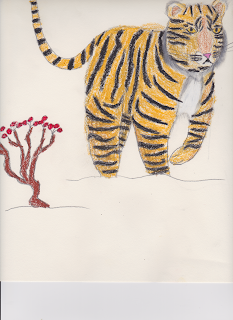 I will post them all, but she wanted the tiger to be first. Enjoy! 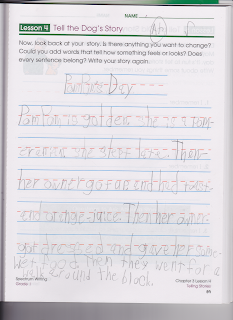 My last posting was Emma's story about "PomPom's Day," her writing assignment last week. This week, she was supposed to revise her story to make it more interesting--which is something that greatly offended her, since she of course believed that her story was perfect and needed no changes. I felt a little bad, but I pointed out that her sentences, while perfectly spelled and grammatically correct, with excellent punctuation, lacked punch. I got the typical Emma Scowl, but she gamely went back to the old drawing board and produced this, which I do think is a worthy improvement. PomPom is golden. She is a pomeranian. She slept late. Then--her owner got up, and had toast and orange juice. Then her owner got dressed and gave her some wet food. Then they went for a walk around the block.